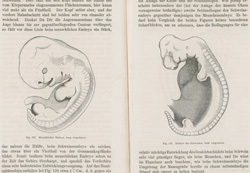 Embryos of lower vertebrates (left) and mammals (right). Haeckel’s various comparative embryological grids were reproduced in diverse forms, some heavily modified but most fairly faithful. Increasingly, the plates were copied indirectly from other works. The main source for American high-school and college textbooks was Darwin and after Darwin (1892), a highly-illustrated review of evolutionism by Darwin’s disciple George John Romanes, which includes a wood-engraving based on the double plate in Haeckel’s Evolution of Man. It appears here in the first of many editions of Claude A. Villee’s elementary college biology textbook, copied via yet another work. Did authors not know about the controversies over Haeckel’s pictures or did they discount them? From Claude A. Villee, Biology: the human approach, Philadelphia: Saunders, 1950, pp. 512–13. Page size 23 x 15 cm. Controversial but standard. Haeckel’s enemies continued to exploit the forgery charges. Controversy exploded in the early 1900s, when organized atheists clashed with anti-Darwinists promoting Christian approaches to science. Biologists did not condone Haeckel’s schematizations, but hardly any doubted (from the abundance of other evidence) that evolution had occurred and a majority defended him against criticism from outside. 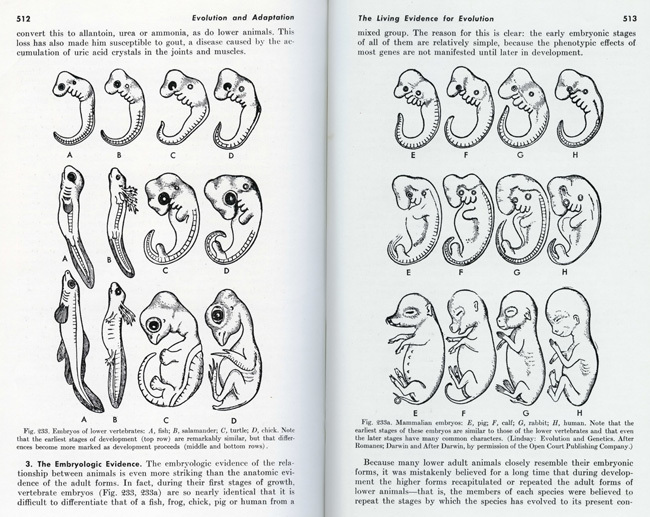 Remarkably, in spite of specialist and antievolutionist criticism, American textbooks reprinted Haeckel’s grids through the twentieth century, as the standard illustration of the embryological evidence of evolution. So some of the most controversial pictures of embryos are also among the most widely seen. In the late 1990s, revived interest in evolution and development combined with the rise of creationism and concern over fraud in science to make his pictures intensely controversial again. Some university teachers of embryology welcomed Haeckel’s pictures, but experts who disagreed with his particular approach to Darwinism accused him of making embryos look more similar than they really are. Haeckel was criticized fast, but the attacks took several years to take off. The Basel zoologist Ludwig Rütimeyer raised the alarm. First, he charged Haeckel with having figures representing different species printed from the same block . Obviously sharp practice, Haeckel corrected this in the second edition and eventually explained it away as ‘extremely rash foolishness’. Second, Rütimeyer said Haeckel had tendentiously miscopied standard illustrations. This was much more debatable. Even as the Natural History of Creation made Haeckel a lightning rod for Darwinist controversy, these figures had enough competent supporters to stay through many editions. 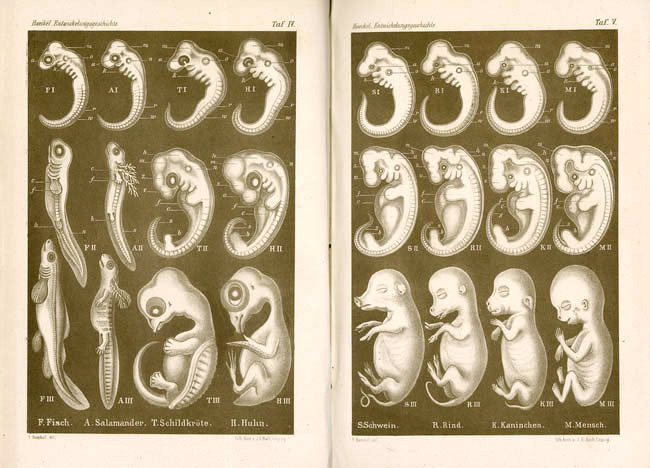 Haeckel’s second semi-popular book, the Anthropogeny (1874), was filled with new and provocative pictures, including a much expanded comparative embryological grid. Rütimeyer’s ex-colleague, Wilhelm His, who had developed a rival, physiological embryology, which looked, not to the evolutionary past, but to bending and folding forces in the present. He now repeated and amplified the charges, and lay enemies used them to discredit the most prominent Darwinist. But Haeckel argued that his figures were schematics, not intended to be exact. They stayed in his books and were widely copied, but still attract controversy today. Haeckel’s ‘comparison of the embryos’ of various vertebrates ‘at three different stages of development’. 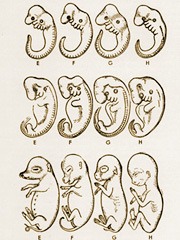 This expanded double plate shows fish (F), salamander (A), turtle (T), chick (H), pig (S), cow (R), rabbit (K), and human (M) embryos at ‘very early’ (I), ‘somewhat later’ (II), and ‘still later’ (III) stages. It was meant to illustrate the similarity between human embryos and those of other vertebrates. Haeckel explained that this is more complete at early stages and retained longer between more closely related groups. Lithograph by J. G. Bach of Leipzig after drawings by Ernst Haeckel from his Anthropogenie oder Entwickelungsgeschichte des Menschen. Gemeinverständliche wissenschaftliche Vorträge über die Grundzüge der menschlichen Keimes- und Stammes-Geschichte, Leipzig: Engelmann, 1874, plates IV–V. Two plates together 23.2 x 30 cm. ‘The specific physiognomies of young embryos’. 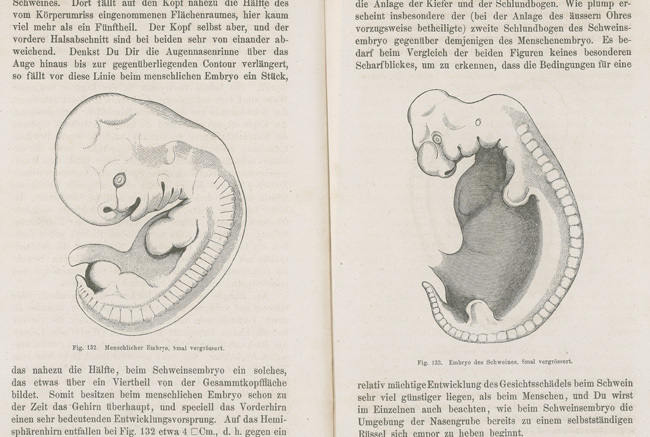 The Swiss anatomist Wilhelm His deployed these figures of a human embryo (left) and a pig embryo (right) against Haeckel. Making great play of having drawn accurately, His highlighted the characteristic differences that were already apparent between the large-brained human and the large-snouted pig. These illustrations appear in the book with which His tried to interest a wider audience in an approach that looked, not to the evolutionary past, but to present-day forces that transform one developmental stage into the next. Wood-engravings from Wilhelm His, Unsere Körperform und das physiologische Problem ihrer Entstehung. Briefe an einen befreundeten Naturforscher, Leipzig: Vogel, 1874, pp. 194–5. Human embryo drawing 8.5 cm high. © Tatjana Buklijas and Nick Hopwood 2008–2010. Last reviewed 2014.